Hi! 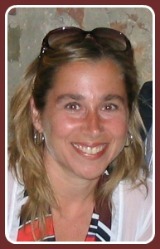 I'm Carol and I was born and grew up in New York City. 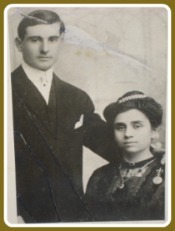 My grand-parents (pic below) were originally from Italy so Italian ways of living were common in my home: pasta dinners on Sunday, grape vines in the backyard, and lots of uncles, cousins, brothers-in-law all named Giuseppe (like my grandfather, father and brother too!). I always wanted to see what the real Italy was like, so after graduating college, I decided to visit Florence. I had studied Italian, and living in Florence would give me the chance to try out all the stuff I’d learned. I fell in love with Florence immediately. The things that I liked so much back then are still the things that I find so great about living here: the small scale and cozy atmosphere of the quaint streets and piazzas, the fact that you can walk or ride a bike to get practically anywhere, concerts, theaters and museums all just outside your door, gorgeous cafés with luscious pastries and a spiffy waiter who is so professional in serving it all to you, fabulous stylish clothes that look great even at market prices, and lovely weather pretty much all year round. Frothy cappuccino and fresh pastries for breakfast, a zillion types of pasta and pizza, juicy steaks on the grill and lots of friendly people who want nothing more than to enjoy a delicious meal in the company of others. That’s another great thing about Florence, the friendly people everywhere you go. Some people have found Florentines to be cold. Perhaps it’s true that some natives feel that tourism has taken over their city and might be hostile towards foreigners. However, I definitely find this to be the exception. In fact, Florence is so exciting because there’s always a ‘buzz’ of people wherever you go, strolling in the streets, chatting at cafés, hanging around in the piazzas. It’s impossible to feel lonely here! Even though my intention was to only spend the summer in Florence, I never left. I found my first job at the San Lorenzo market selling leather belts. This is where I really learnt to speak Italian! But I had a degree in English literature so I eventually decided to look for a ‘real’ job. I found a job in a school teaching English and eventually worked my way up to a position at a local university, where I still work now. Teaching is great, but I had been yearning to do something else on the side, something of my own, a pet project that I could work on in my free time. Also, for years I had been thinking about what I could do to give back something to Florence – I was so grateful and felt so fortunate to be living here, and I wanted to give something in return. The idea to start this site was the answer. I decided to help others to love this city as much as I do, to share what I know with people who might not otherwise find the opportunity to discover the authentic Florence. This website is also a sort of coming full circle for me. Years ago I came here knowing practically nothing about this city, and now I can share my local experience and knowledge with visitors who come to Florence for the first time, like I did over 20 years ago. Mostly, though, it’s my enthusiasm for Florence – and my need to share it - that is the driving force behind these pages. Whether you would like help in planning a trip to Florence or are just reading this site to find out more about one of the most loved cities in Europe, I hope you find the information on these pages helpful and interesting. If you read a page, and feel that you want to learn more, then I’ve achieved my goal. FlorenceWebGuide lets you experience Florence in your own home. Reading about the city’s history, culture, locales, traditions and life style is the first step to really knowing (and loving) Florence. 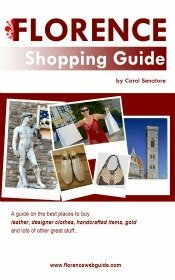 Your journey to Florence - whether actual or only ‘virtual’ - starts right here.